St. Petersburg, Hermitage, no. 111 (catalogue of 1964). Canvas, transferred from panel in 1862, 111 x 75.5. There appear to be numerous small losses, especially noticeable in the drapery across the Virgin’s right shoulder and breast and in the bodies of the angels below, all of which are filled. A large patch in the upper right corner appears to be repainted. The large areas of the Virgin’s outer garment over her left arm and hip and her right leg seem to have darkened and some of the present modeling of them may be later additions. A general flatness of the surface may be the result of its transfer to canvas. The Madonna’s mantle is very dark green with the undergarment over her right shoulder and breast a deep rose-red. Her head is wrapped in dull brown drapery. The drapery of the Christ Child and of two of the angels below is olive green. The background is an intense dark green, more yellow around the Virgin, more blue below. The upper cherubs and the two behind the Virgin at the right are dark, dull green. Natural flesh tones elsewhere, becoming very pink at the extremities of noses, fingers, and toes. The foremost angel below is executed in cool gray-browns. Hair, various shades of brown. PROVENANCE: Acquired in Paris in 1810 through the agency of Baron Vivant Denon. Milanesi, in Vasari-Milanesi, V, 1881, 174, n., as Rosso. Goldschmidt, 1911, 51, as Rosso, according to Milanesi. Voss, 1920, 189, as Rosso. Kusenberg, 1931, 14, 128, 184, n. 32, Pl. 7, as Rosso, between 1518 and 1521. Venturi, IX, 5, 1932, 231, as Rosso. Kusenberg, 1935, as attributed to Rosso, around 1517. Becherucci, 1944, 27 (1949, 28), as Rosso, 1521-1522. Barocchi, 1950, 45-46, 246, Fig. 28, as Rosso, around 1522. Longhi, 1951, 61 (1976, 101), as Rosso. Briganti, 1953, 53, as Rosso, around 1520. 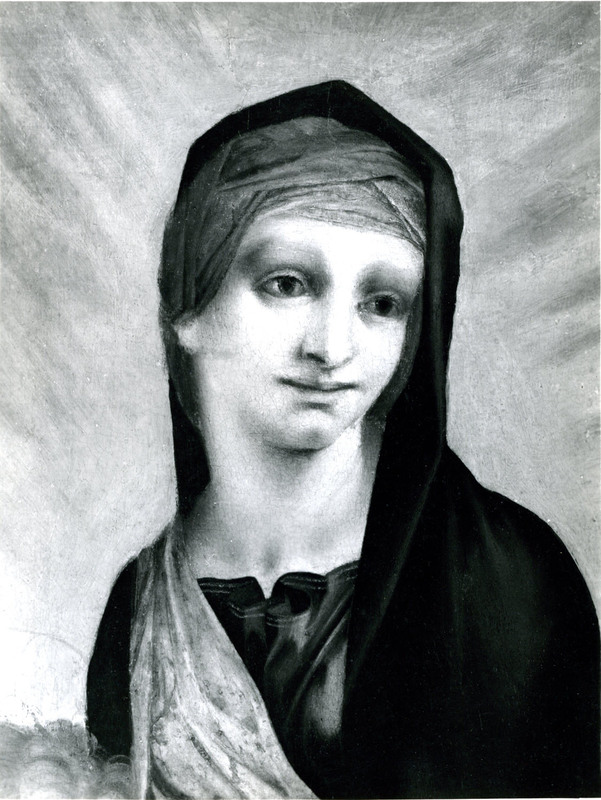 Baldini, in Mostra del Pontormo, 1956, 130, no. 163, Pl. 99, as Rosso. Sanminiatelli, 1956, 241, Fig. 26, as Rosso, 1519 or 1520. Oertel, 1956, 214, as Rosso. Shearman, 1957, I, 225, II, 217, n. 11, 218, n. 14, as Rosso, 1517 or 1518. Barocchi, 1958, 236, as Rosso around 1518. Freedberg, 1961, I, 539-540, 607, II, Fig. 662, as Rosso, around 1515. Berenson, 1963, 195, Pl. 1469, as Rosso. Vsevolojscaia, S., I. Grigorieva, and T. Fomitchova, La Peinture italienne des XIII-XVIII siècles dans la Collection du Musée de l’Ermitage, Leningrad, 1964, 243, 300, Pl. 91, as Rosso. Griseri, 1964, 17, reported Longhi’s attribution to Pedro Machuca and his dating of it around 1520. Carroll, 1964 (1976), I, Bk. I, 26, 30, Bk. II, 101-105, P. 6, II, Bk. III, Fig. 9, as Rosso, around 1515-1516; “Addition to the Preface,” 1976, vii, as not by Rosso. Borea, 1965, as Rosso, 1517 or 1518 or a little later. Longhi, 1969, 36, Pl. 24, as possibly done by Machuca in Florence around 1518-1520. Freedberg, 1971, 484, n. 21, as Rosso, around 1515. Freedberg, 1972, I, 632, as Rosso, probably around 1519. Caron, 1983, 7, n. 2, doubted the attribution to Rosso. Alba Costamagna, in Aspetti dell’Arte, 1984, 126, 127, Fig. 47, as by Pedro Machuca, around 1517-1519, and related to Raphael’s Madonna di Foligno through Marcantonio’s engraving (B.47). Dacos, 1984, 337, 360, n. 15, as Rosso, in 1518 or 1519, and as influential on Machuca’s Vierge du Suffrage in Madrid. Alba Costamagna, in Aspetti dell’arte a Roma prima e dopo Raffaello, Rome, 1984, 126, 127, Fig. 47, as by Machuca, and influenced by Raphael’s Madonna di Foligno. Nicole Dacos, in Andrea da Salerno, 1986, under no. 21, as by Machuca in Florence in 1517. Francesco Abbate, in Andrea da Salerno, 1986, 144, Fig., under no. 26, as by Alonso Berruguete. Angelini, 1986 (1987), 91, n. 5, as an early work by Rosso. A. Giovanetti, in Pittura, Cinquecento, 1988, II, 825, as Rosso. Ciardi and Mugnaini, 1991, 11, 13, 14, 17, 18, 21, 24, 42-47, no. 3, with 4 Color Pls., as Rosso, datable between 1513, 1514, and 1518. Costamagna and Fabre, 1991, 25, n., as by Machuca, close to Berruguete, and under the influence of Rosso. Franklin, 1994, 30-32, 118-119, 205, Color Pl. 24, Pl. 25, as an autograph work by Rosso done around the time of his sojourn at the Annunziata, but likely after the Assumption, and perhaps as late as 1520. Marchetti Letta, 1994, 15-17, Color Fig. 16, 17, 20, as Rosso, 1512-1513, and reflecting Michelangelo’s Bruges Madonna. Costamagna, 1994, 94-95, n. 26, as Machuca. Burresi, in Rosso e Volterra, 1994, 145, under no. 3, as Rosso. Ciardi, 1994, 30, Fig., 31, 47, Fig., 48, as Rosso, the angel at the left from a back view of Michelangelo’s David. However attractive the attribution of this picture to Rosso has been, even to me at one time, it now seems to me that it cannot be by him. 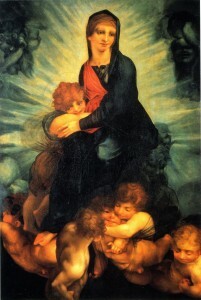 The similarities to his art, to the Assumption of 1513-1514 most particularly, are not sufficiently close to warrant the attribution of the Madonna in Glory to Rosso. The drawing in the painting is much too vague and incoherent, the tone too chiaroscural, the color too generalizing, and the sentiment too ingratiating for Rosso. I cannot reconcile the large eyes, the lifted brows, the too quick Leonardesque smile of the Virgin in the St. Petersburg picture (Fig.RP.22c) to the more serious expressions of the Virgin in Rosso’s Assumption (Fig.P.3e) and in his S. Maria Nuova Altarpiece (Fig.P.5e). Although it is likely that the painting is by someone who knew Rosso’s work in Florence, it would seem not to be by an artist who was actually trained there. In all respects the disegno of the picture is not fundamentally Florentine, but only imitative of it. Freedberg pointed out its relationships to Raphael, to Michelangelo, and to Fra Bartolommeo, with which I concur. But I am inclined to believe the picture is by an artist who had been in Rome, as Rosso had not by the time this picture, if by Rosso, supposedly would have been done. Longhi thought it might be by Machuca while in Florence around 1518-1520, after a period in Rome. 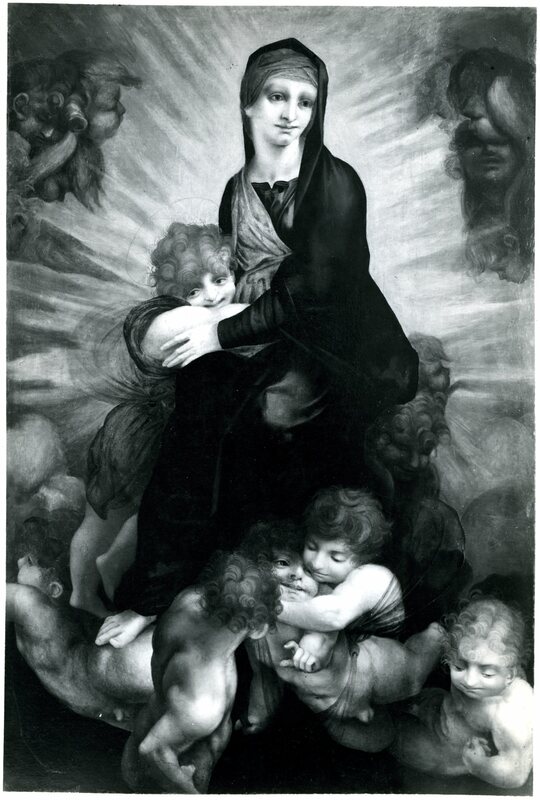 He compared it with Machuca’s Madonna del Suffragio of 1517 in Madrid (Longhi, 1969, Fig. 23). 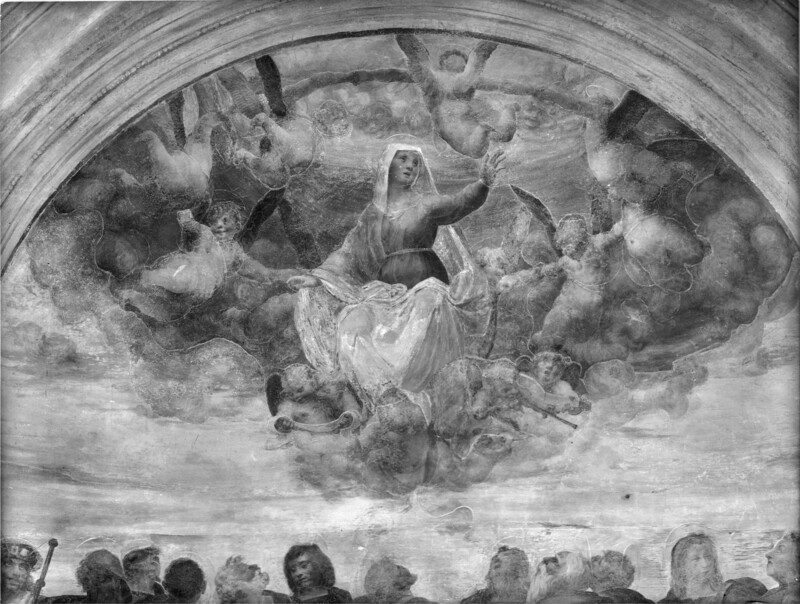 Dacos recognized the connection but thought the St. Petersburg painting had to have been done by an Italian, by Rosso specifically, and that it was influential upon Machuca’s picture. The relation between these two pictures seems to me to be very close but there is no reason to recognize any influence of Rosso in the signed painting of 1517. 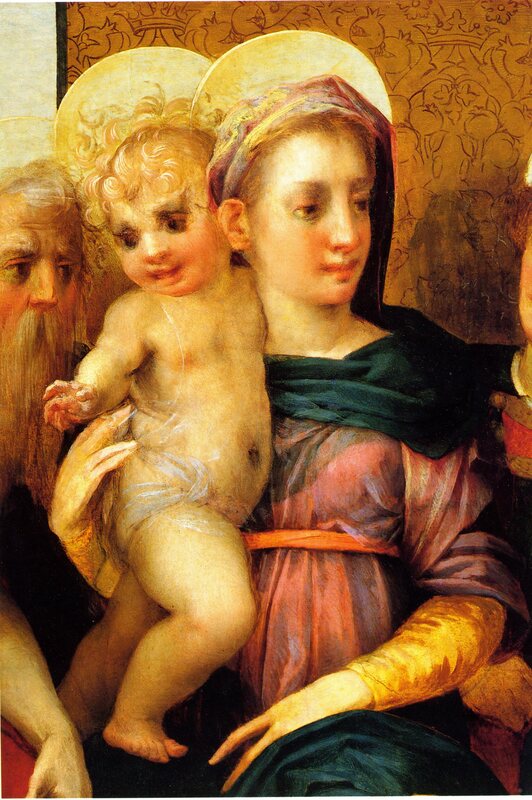 The generalized Italianate character of the Madonna del Suffragio is as learned from Italian paintings, not from the training in drawing and in disegno of Central Italian artists themselves. It is very likely that the St. Petersburg picture is by Machuca, as indicated by Longhi, Costamagna and Fabre, although I do not feel as certain of this as I am that the work is not by Rosso, influenced by his art as it is.